The Axopar Brabus Shadow 800 is not your average speedster. Two steps, two chines and lots of classy patrol-boat style. The new Axopar Brabus speedster leaves us suitably impressed. While I’d seen an Axopar or two at the America’s Cup races in Bermuda in 2017 (high-profile Cup racer and Olympic sailor Sir Ben Ainsley had one on hand for his personal use), my first formal introduction to the Finnish brand took place last summer in France. While I was taking a morning stroll around the Cannes Yachting Festival something truly cool transpired. Jan-Erik Viitala, Axopar’s CEO, stuck out his hand, slapped me on the back and suggested I test drive his hottest new model, the 37-foot Axopar Brabus Shadow 800. I’d appreciate her high-speed, high-horsepower, double-stepped performance, he said, as well as her glamorous style, courtesy of Brabus, a German company famous for its aftermarket tuning of top-shelf automobiles. The Brabus touch is evident in the precisely finished interior. I arrived dockside an hour beforehand, primarily because I wanted to examine the Shadow in an unhurried manner, well before the excitement began. The layout, for starters, was simple—the boat is essentially a large walkaround, with a longish T-top, three reversible seats at the helm, four seats aft (facing a fold-out expandable table), a crisply upholstered lounge area forward and, beneath it, a cabin with V-berth, electric MSD (with privacy curtain), flatscreen TV and lounge seating. The Brabus influence, however, was unmistakable, with everything from a monogrammed leather steering wheel at the helm (with inset switches for control surfaces and media) to a phalanx of intricate badges in all the Silvertex upholstered seats. Once I got behind the Shadow’s wheel, the first thing I had to do was ask myself—was it really going to be possible to safely record performance numbers at the present time? I mean, the sea state was a freakin’ mess, with a six-to-eight-foot swell rolling in from the south, surmounted by a honking melee of mondo megayacht wakes, each roistering off in a different direction. “Rough,” I opined, as the boat rolled and lurched at idle speed. An Axopar Finn, who’d been delegated by the super-busy Viitala to come along for the ride, grimaced. “Rough,” he agreed, shaking his head. 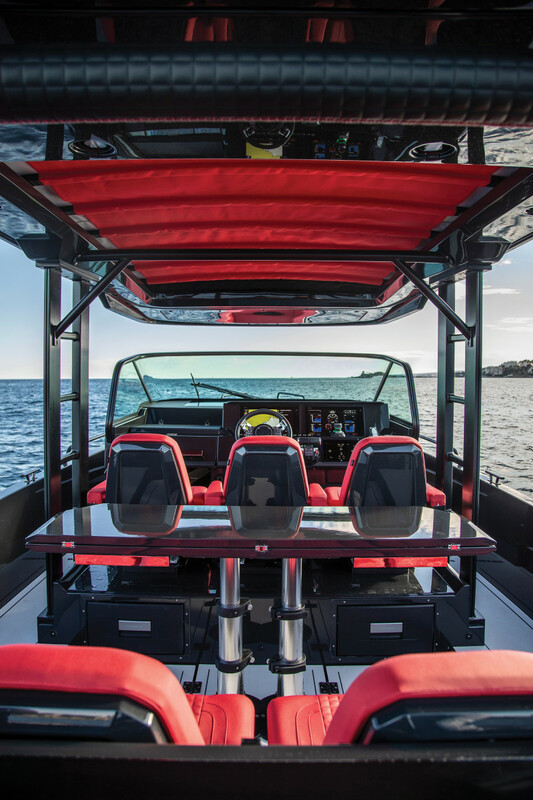 Extra-deep gunwales inspire confidence while driving at speed. A couple of miles south of the Jetée Albert Edouard, I pointed the Shadow’s bow toward the city of Mandelieu-de-la-Napoule well to the west and eased the throttles up to 3500 revs to gauge the boat’s response. Given the complete absence of flare in the forward sections, I half expected to catch a bucket or two of seawater in the face as a result of the exercise. But nope, not a drop. 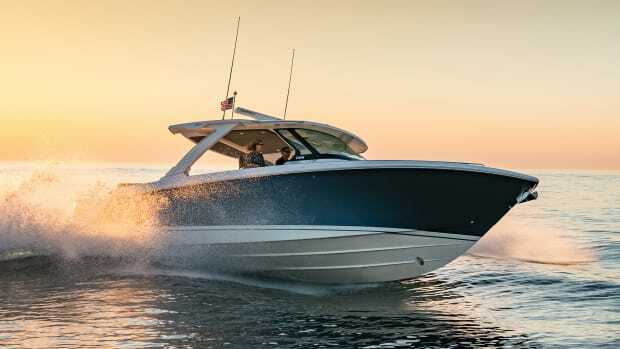 And considering that the propulsion package at the Shadow’s transom consisted of two, bracketed, 400-hp Mercury Verado 400Rs, weighing in at 668 pounds apiece, I also half expected a whopping bow rise coming out of the hole. But hey, nope again. According to my inclinometer, just a little over five degrees of running attitude had put us on plane. Of course, the fun factor was kicking in. 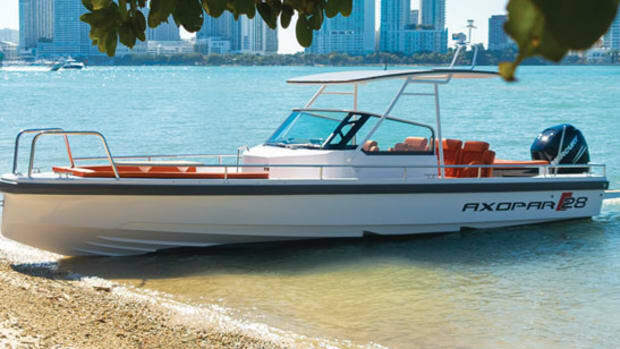 Thanks to Mercury’s Active Trim, a GPS speed-based system that was automatically trimming the two 400Rs for optimum efficiency, speed and handling ease, I was now bopping across a literal pandemonium of waves and wakes at 20 knots with little more to do than steer and enjoy. So, what the heck! I bumped ‘er up to 5000 revs, tweaked the westerly course slightly, saw our speed jump to well over 40 knots and, with quick glances aside, watched the white caps whirr smoooothly past. What the heck indeed! I firewalled the sticks, watched the revs climb to 6000 and soon hit almost 50 big ones, although a slightly lesser number recorded on a reciprocal run would bring the average wide-open speed down to 48.4 knots. The Shadow seemed to darn near fly across the water. And the hardover turns? Without a hint of blowout or slide? Whoooeeeeee! What a ride. Based on the driving impressions I subsequently logged over the next hour or so, as well as some videos I later watched showing a Shadow running in open water, I’d say there are three basic reasons for such fast, easy-driving athleticism. 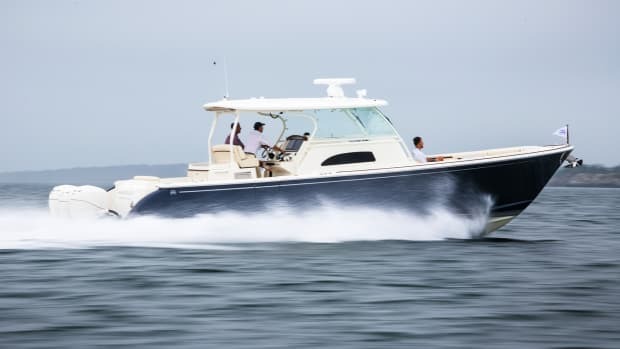 First, thanks to the steady but distinctive running attitudes the boat displays at speed, with that long, narrow, lifting-strake-laden bow held high, her deep-V running surface doesn’t encounter the water until it’s well abaft her snubbed bow. This virtually negates the necessity for bow flare. 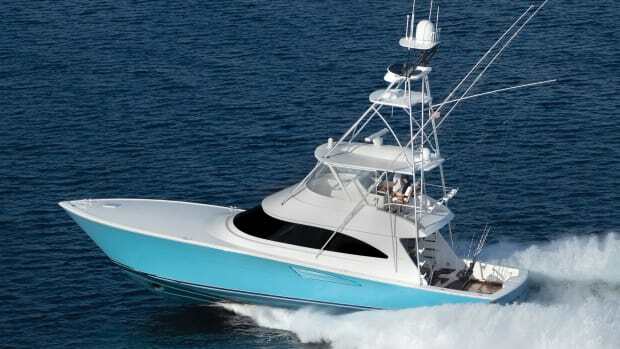 Spray simply blasts away—low and diagonally—from a slab-sided spot amidships. 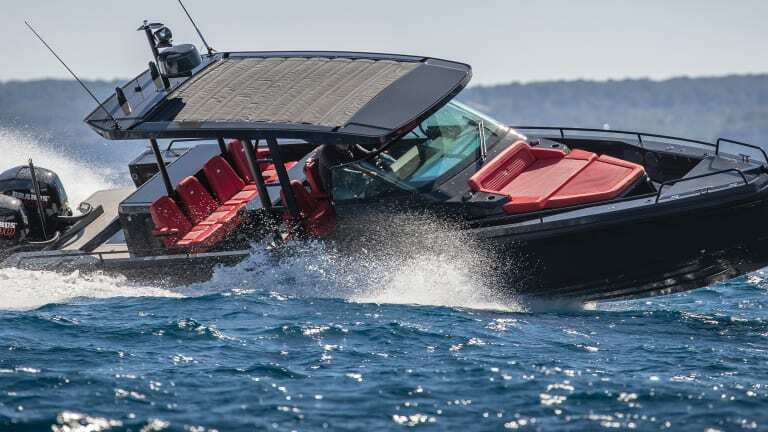 Indeed, once I’d finished tearing up Cannes Bay, often at close to 50 knots, with tight turns and figure-eights galore, there was nary a drop of seawater on the windshield. Next comes hull form. 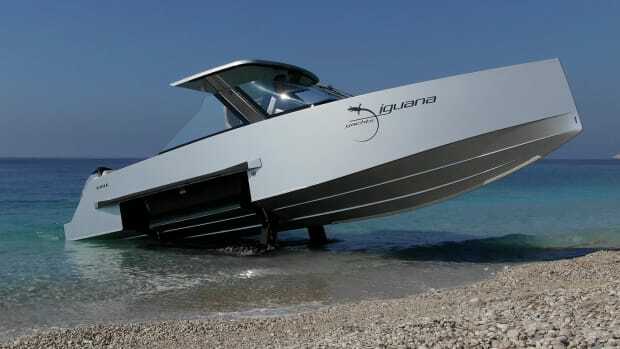 Although the Shadow is a fiberglass speedster through and through, her underbody is very much like that of a high-performance, rubber-collared RIB. 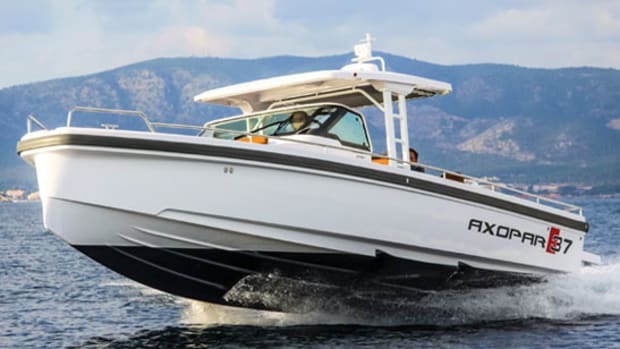 More to the point, above the boat’s primary, stem-to-stern chine, there’s a second chine that stabilizes the boat transversely in the same way a RIB’s collar does. 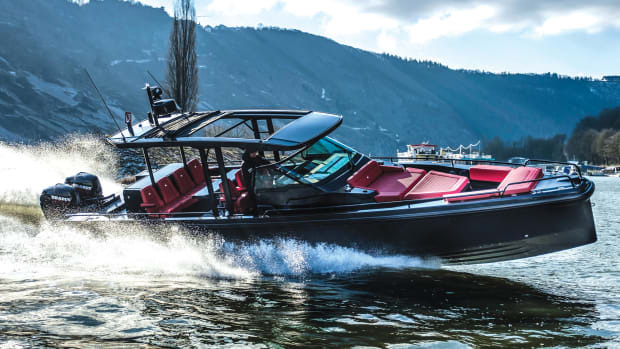 Combine this feature with an exceptionally low vertical center of gravity—while the Shadow’s inwales are confidence-inspiringly high, her deck is only inches above the waterline—and you get remarkably solid tracking, both in turns and on the full-throttle straight and narrow. And finally, there are the two, sizable steps. Located approximately amidships, they undoubtedly engender oodles of lift, most of it in the vicinity of the longitudinal center of gravity, thereby helping to generate the aforementioned, dry-riding running attitudes. In addition, they also undoubtedly boost speed and synergize with the chine design to even further improve transverse stability, especially in challenging sea conditions. I completed my test of the Shadow rather memorably. 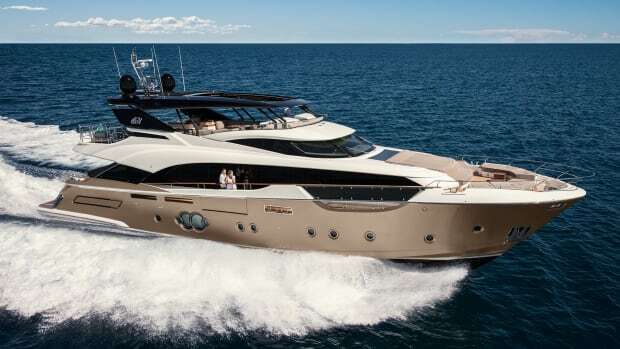 In order to accommodate all the new boats that make the trip to the Cannes show each year, a pontoon is stretched across the mouth of the port and periodically retracted to offer access to Cannes Bay for sea trials. 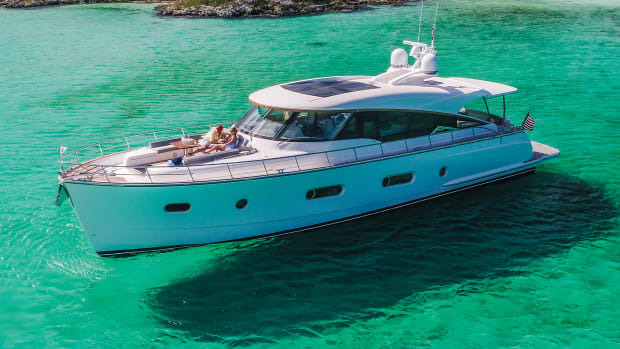 So, after enjoying a jolly good test drive, I found myself nervously holding station, just inside the jetties, amid a veritable slew of vessels, from megayachts to runabouts, all jockeying for position, waiting for the pontoon to retract so they could get back into the show. It was total mayhem. And it only took a minute or two for me to decide to trade valor for discretion under the circumstances and hand the helm over to my Finnish friend, who promptly took a savvy little action I’d failed to think of myself. He hit the Skyhook button, thereby energizing the dynamic positioning capabilities of our test boat’s Mercury Joystick Piloting system. In seconds, we were hovering peacefully in the midst of chaos, enjoying the appreciative looks our fellow boaters were giving the Shadow’s dark, spare, patrol-boat profile. Some folks even waved, rather enviously it seemed. Test Conditions: Seas: 4-6 ft.; wind: 10-12 knots. Load: 75 gal. fuel, 10 gal. water, 3 passengers. Speeds are two-way averages measured w/Garmin display. GPH estimates taken via Mercury SmartCraft monitoring system. Range based on 90% of advertised fuel capacity. Decibels measured at lower helm on A scale. 65 dB(A) is the level of normal conversation.